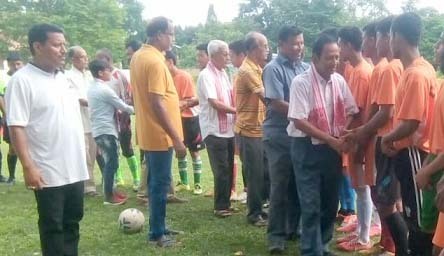 Aroonodoi Sangha got the better of Dahi Anchalik Krira Sangha by a solitary goal in the inaugural match of Kumar Jyotirindra Narayan Dev Memorial Inter-club ‘A’ Division Football League 2018 at Mangaldai in Darrang district on Sunday. The league has been organized by the Mangaldai Sports Association (MSA). In the keenly contested inaugural match of the tournament played at the Mangaldai Vidyapith playground, Diganta Barua netted the all important winning goal for the winning team, Aroonodoi Sangha. Abdul Hannan conducted the match as the referee. Earlier, the tournament was ceremonially inaugurated by veteran footballer Ali Hussain in presence of several prominent veteran and young footballers and office-bearers of MSA including Nagendra Choudhury, Ranjit Dutta, Mohan Deka, Anjali Deka, Pradip Talukdar and trophy donor Mira Debi among others. Meanwhile, talking to this correspondent, Bipul Kr Sharma, MSA football secretary informed that a total of eight clubs have participated in this year’s tournament and the final match will be played on September 9 next.